The Kanalkampf comprised a series of running fights over convoys in the English Channel and occasional attacks on the convoys by Stuka dive bombers. It was launched partly because Kesselring and Sperrle were not sure about what else to do, and partly because it gave German aircrews some training and a chance to probe the British defences. 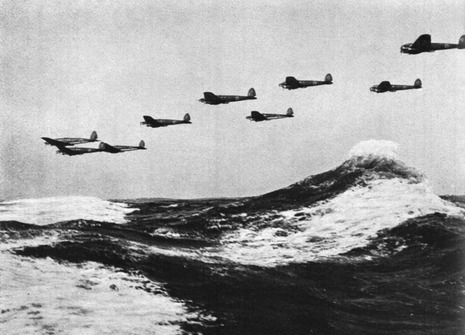 In general, these battles off the coast tended to favour the Germans, whose bomber escorts massively outnumbered the convoy patrols. The need for constant patrols over the convoys put a severe strain on RAF pilots and machines, wasting fuel, engine hours and exhausting the pilots, but eventually the number of ship sinkings became so great the British Admiralty cancelled all further convoys through the Channel. However, these early combat encounters provided both sides with experience. They also gave the first indications some of the aircraft, such as the Defiant and Bf 110, were not up to the intense dog-fighting that would characterise the battle. During the Kanalkampf phase of the battle, approximately 40,000 tons of British shipping was sunk but the Royal Navy was untouched during these raids. Various estimates exist for the number of aircraft shot down on both sides, but it appears approximately 180 German aircraft were shot down to 70 British. Since approximately 100 of the German aircraft lost were bombers, the fighter to fighter destruct ratio was relatively even. Stephen Bungay in his excellent ‘The Most Dangerous Enemy’ has figures of 85 Luftwaffe aircraft written-off in accidents alone between 10th July and 11th August (for a total of 301 Luftwaffe aircraft destroyed against 162 for Fighter Command). Of the 162 destroyed planes of Fighter Command between 10th July and 10th August, 47 were lost in accidents. The disparity comes from the scope of the Kanalkampf. The number of Luftwaffe losses that Bungay points out is referring to absolutely all of Luftwaffe losses during that period, while the RAF losses are only those of Fighter command.